Happy New Year! It’s hard to believe that 2016 is already over. And yes, I know we all say that every year, but as I’ve gotten older I have found that the years have started to practically fly by! One of the things I think we all like to do at the end of the year is to take stock in what has been accomplished. So, I thought it would be fun to share with you my Top Ten Posts of 2016. I always enjoy looking at what you’ve liked and commented on most. It’s also interesting for me to see if my most “popular” posts are more decor or fashion oriented, since I do talk about both. 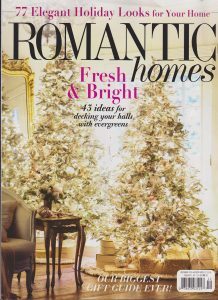 This year, it was definitely more home design oriented, but there were still two fashion posts that made the list. So, without further ado, here they are….. 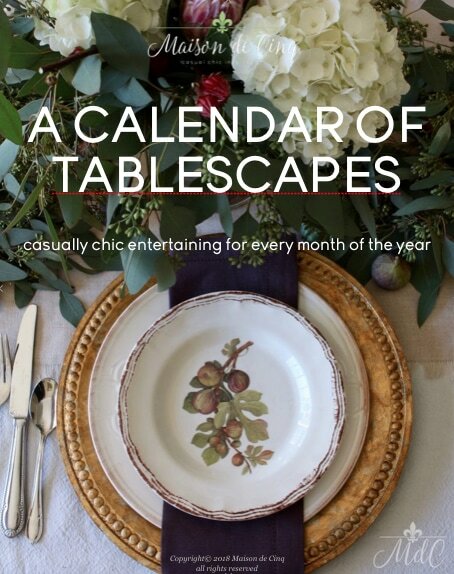 This was a fun post for me since I always love tablescapes! I partnered with a group of some of my favorite blogger friends to present different ways of decorating a holiday table. I focused on neutral Christmas colors and more of a natural look, and I loved the way it turned out. You can see the full post, with all my sources, here. 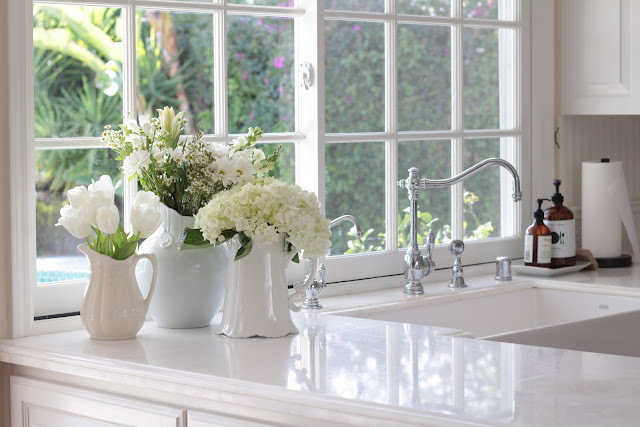 The next most popular post was a Friday Favorites posts and this one talked about one of my all time favorite things – white kitchens! Apparently you all love them as much as I do! This post has so many amazing examples; lots of eye candy and pin-worthy images! Home tours consistently tend to be amongst my most popular, and this year was no exception. This was actually my first ever Spring tour, and I loved being a part of it. Again, I teamed up with some amazing bloggers and there was a ton of inspiration! I was so happy to see that one of my posts from the Collected Look Series was included in the Top Ten Posts of 2016! This series is about how to get a “collected look” in your home decor, and it’s also one of which I am most proud. It’s something that I truly believe in and that I strive to achieve in both my own home and those of my clients. If you click on the #5 post, you can also get to the previous four posts in the series. And the first fashion post debuts at the 6th most popular post of the year! This post was during last summer so of course, it’s very seasonal. However, it’s also timeless. A clean, crisp white dress is a classic and always in style! The second home tour to make the Top Ten Posts of 2016 list was actually my second Christmas tour this year. 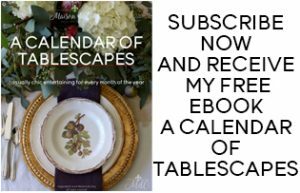 Here I partnered with 15 other bloggers, each of whom had a different take on decorating for the season. In this tour, I featured my entry way, dining room, and living room. 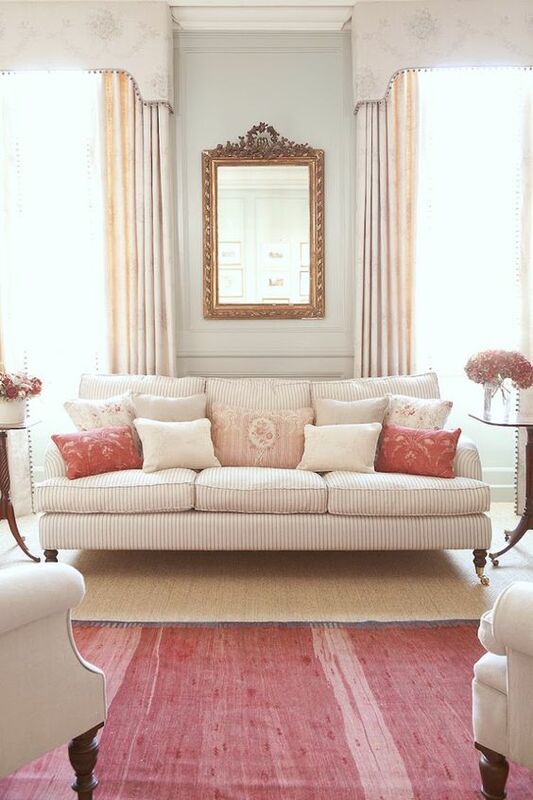 The second Friday Favorites post to make the cut was this one featuring the pink color trend. This was the first time I touched on both fashion and interiors in the same post, and it still consistently gets views! Yes, another home tour! This time I partnered with bloggers who were not a part of my other holiday tours so it was fun to meet and get to know them! My decor was again very neutral. 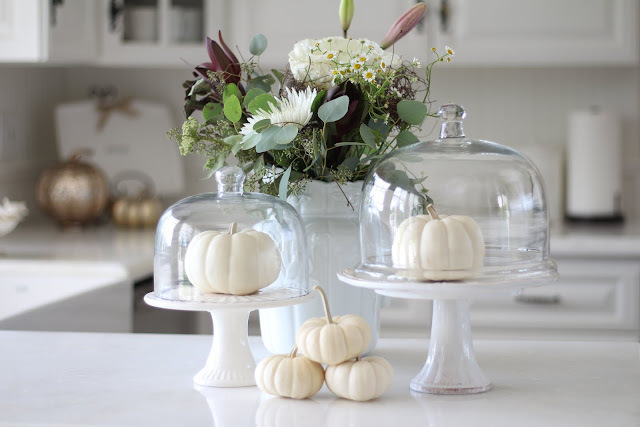 I used natural elements, mostly white pumpkins, and flowers to convey the feeling of fall I was looking for. The last home tour to make the list of Most Popular Posts of 2016 was actually my 2nd Christmas tour. All nine of the bloggers involved had a definite farmhouse style, but it was fun to see how each interpreted it in their own way. 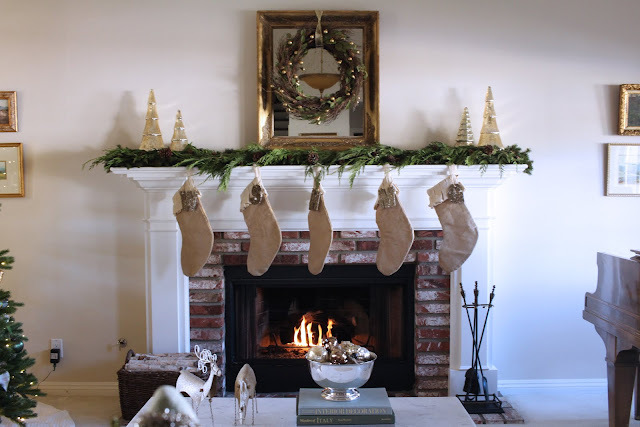 In this tour, I shared with you the kitchen and family room all decked out for the season. I must confess that even I was surprised to find that this made the number one spot of Top Ten Posts of 2016! I would have expected one of the home tours to be here, or maybe even a Friday Favorites, but the fact that this was the most popular shocked even me. 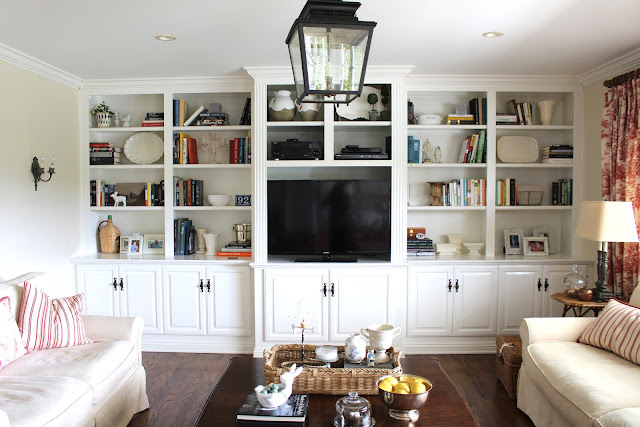 This post was from last March and it was about re-styling my family room built-ins and how I was inspired to re-arrange them. I’d also like to say thank you to all of you for hanging in there with me. As a fairly new blogger, it has sometimes been difficult to consistently keep posting and to get a footing in a new field.. However, I have had so many amazing things happen this past year, and I have you to thank for it. Without readers, there would be no blog. So thank you from the bottom of my heart. Thank you for subscribing, commenting, and supporting me, it means more than I can say. And I hope you’ll choose to stay with me for as far as this journey takes me! Sheila, I enjoyed your round up of your most popular posts. Your blog is delightful, and I love that you mix fashion with the decor… I see fashion as one's own personal decor so that is why I really love that pink post! Looking forward to see what you write about this year!!! Hugs, Angelina oh ps I fixed my link party, something screwed up in the code, but it's all better now. This is truly the sweetest comment! Thank you so, so much my friend – both for your support and for your friendship. I am always appreciative of your wonderful and continual support. You are such a giving friend, and I love that you always are lifting up others. Thank you my friend:) Here's to another year of blogging and inspiring each other – and to meeting again in 2017! Sheila, I loved seeing what was most popular on your blog. You really have published some gorgeous and inspiring posts this year and I have enjoyed following along the way. Your beautiful style reflects your personality and comes through in everything you do. It's been wonderful getting to know you both in person and through your blog and I look forward to hanging out with you more in the future. I know you will have an amazing year and I wish all the best for you, dear friend!